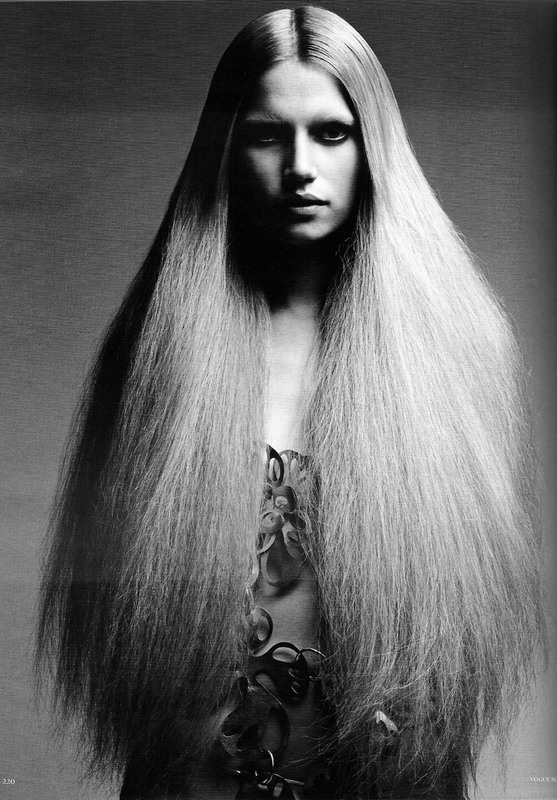 Photography by Patrick Demarchelier, hair by Luigi Mureno and styling by Katie Mossman for the May 2010 issue of Vogue Germany. I’m feeling like a change in the hair department, though, as per usual can not decide what the heck to do. I usually have an idea that I’ll run with prior to my appointment then forget to bring an image of the style I’m lusting over on the actual day. Luckily I have the most amazing hairdresser in the world who can easily decipher the pig latin that slurs out of my mouth in the most inarticulate manner. I honestly don’t know how she ever understands what I say and truly don’t know what I’d without her. I am trying to improve – though I’ve been telling her that for almost eight years now, and have been feverishly searching for some semblance of hair inspiration or style I want, particularly colour wise. Keep the jagged, ombre locks or stick to a dark, solid colour? Will someone just decide for me!